Art enthusiast Gérard Bauer said he does not recognize the Paris that Bernard Buffet painted because he grew up prior to WW II. Bauer claims that before the “inhuman period," artists such as Manet, Monet, Pissarro, Degas, Seurat and Renoir were guided by a deep affection for the city and used color and a delicacy of touch creating a language of affection and truth for a Paris that had never been as finely painted as she was between 1830 and 1910. Bernard Buffet was born July 10, 1928 in Paris, France. He spent his youth there apart from summer holidays. At 15, he entered the École Nationale Supérieure des Beaux-Arts and worked in the studio of the painter Eugène Narbonne. However, it was 1943. Paris was a capital occupied by Nazi Germany and it was a city of secrets, furtive exchanges and a life full of restrictions. One wonders if that is why an artist named Bernard Buffet would make representations of Parisian architectural wonders and buildings without a human element? Although he excelled in painting and drawing and won prestigious prizes, maybe that is why he still used glum imagery and a signature technique with thick black angular lines. Perhaps a child growing up in such a city might want to eliminate the human element. The Buffet-depicted city is naked; devoid of people or activity. The buildings, canals, churches, cathedrals, boulevards are like a stage set of a play before anyone enters the building. Even the trees do not bud. There is not even a crow or a sparrow. A year into the Beaux-Arts’ study, Buffet painted a crucifixion. Expressionism is an escape from reality. Centuries before, art imitated the outside world until European painters decided to alter reality to express their own desires, opening up their brains in a world of imagination. This period of art lasted from 1905 to 1950. What finished Expressionism in Germany was the brutal and coldly calculated campaign waged against it by the Nazis. The Nazis tolerated the more established pieces in the early years but as time went by, they finally demonized it calling it “volkswidrig," adversary to the people. The Buffet style of Expressionism defined is a bold, graphic mastery of technique outlined with thick line and inspiring an almost graphic animation. It was a style not in vogue in Buffet’s time and the commentators who viewed and discussed it were angry and cruel. Buffet also depicted scenes with alienation, sexual ambiguity and wartime violence. Critics were taken aback by his images of flowers and clowns and crossdressers demonstrating the same style he used on table lamps and ashtrays. Speaking about Bernard Buffet today has a different ring however. Buffet had such an innovative approach and a striking intensity of art that Fabrice Hergott, director of today’s Musée d’Art Moderne says, “Buffet has painted hundreds of masterpieces," he said. “His œuvre is one of the greatest of the 20th century." Buffet was a rock star before there were rock stars, recognized at age 20. There were different schools of art and periods that passed him by during the so-called Modern age like Abstraction, Minimalism and art deemed avant-garde. Picasso openly criticized his work. No matter. Buffet had his look, along with being bisexual, a socialite and, late in life, an alcoholic recluse. He was the public man’s artist in an era that celebrated fashion designer Yves Saint Laurent, bombshell Brigitte Bardot and playwright Françoise Sagan. He grew in popularity helped by a tenacious devotee in the art world, Maurice Garnier. 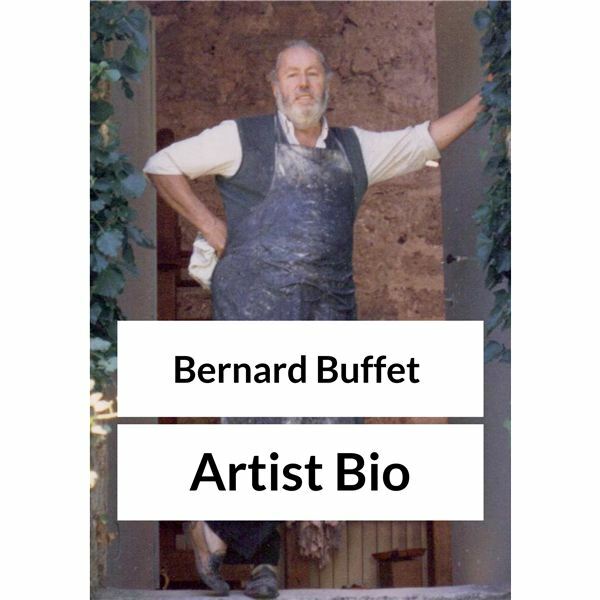 Buffet became rich and lived rather ostentatiously—in poor taste post-war to most, but Garnier first met Buffet in 1948 and immediately began showing his work, devoting an entire Parisian gallery to Buffet alone. Bernard Buffet bought an island, a chateau, a boat and a Rolls-Royce automobile before the age of 30. In November of 1973, a Bernard Buffet Museum was founded by Kiichiro Okano, in Surugadaira, Japan. Later in life, Buffet was diagnosed with Parkinson’s disease, which eventually robbed him of his ability to paint. Depressed with the loss of his art and tired of fighting a prolonged battle with the disease the artist chose to end his life. He committed suicide using a plastic bag taped around his neck. Bernard Buffet died at the age of 71 on October 4, 1999 in Tourtour, France. Arnason, H.H. and Elizabeth C. Mansfield. The History of Modern Art. Upper Saddle River; New York University: Prentice Hall, 2010. Finger, Brad. 13 Art Movements Children Should Know. New York: Prestel Publishing, 2014. Book. Hazan, Fernand. Bernard Buffet Paris: Petite Encyclopédie de L’art. New York: Tudor Publishing, 1961. Book. Bassie, Ashley. Expressionism. New York: Parkstone Press International, 2008. Book.